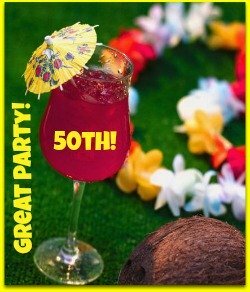 When coming up with 50th birthday party ideas, GO BIG! So, my big ideas and suggestions center around a theme. And the theme is the surprise vacation gift you'll be giving. For example, are you sending the birthday boy or birthday girl to Hawaii? Then birthday party ideas would center around Hawaii. Just think . . . surprise vacation, surprise party! With this type of party you will need to get the help of friends. Do you have friends with expertise in cooking, bar tending, scheduling, decorating, shopping, picture taking? Now is the time to enlist their help. Plus, in order to make sure this party stays a secret you'll need all the help you can get. Sweet and sour ribs, spicy shrimp, pineapple rice, fruit salad, mai tai's, and coconut birthday cake! Doesn't that sound yummy! Turning 50 is so monumental, so should the party and gift be. With a Hawaiian party first start with the invitations. Make sure you let the guests know this is a SURPRISE. Continue to create the theme with a cute door mat. When they walk up to the door and see this . . . they'll begin to wonder??? Now make a personalized banner that you can use inside or outside. You have to admit, this is different than the regular birthday banners. That's what is so great! Check out these awesome tropical decorations! I really like the bottled invitations. If there's one item you like - click on it because it could be part of a set. You'll be able to find matching table clothes, napkins and plates. Guests can bring gifts that will go perfect on your trip. Or, they can chip in for a fun and special dinner or outing once you arrive in Hawaii. Other 50th birthday party ideas can be created around any surprise destination! With your imagination and a little help, you can create some pretty wonderful birthday wishes for a friend! I think the best thing I like about this kind of themed party is it shows how much time you put into planning. Here's to a wonderful 50th birthday party!